Federal agency contingency plans for the ongoing government shutdown. NSF’s New Award Term and Condition: "Notification Requirements Regarding Sexual Harassment, Other Forms of Harassment, or Sexual Assault"
Reduced burden related to FDP partner institutions and Subrecipient Commitment Forms. 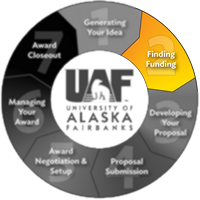 See here under "Subawards"
For assistance with this website, please contact UAF-OGCA@alaska.edu.